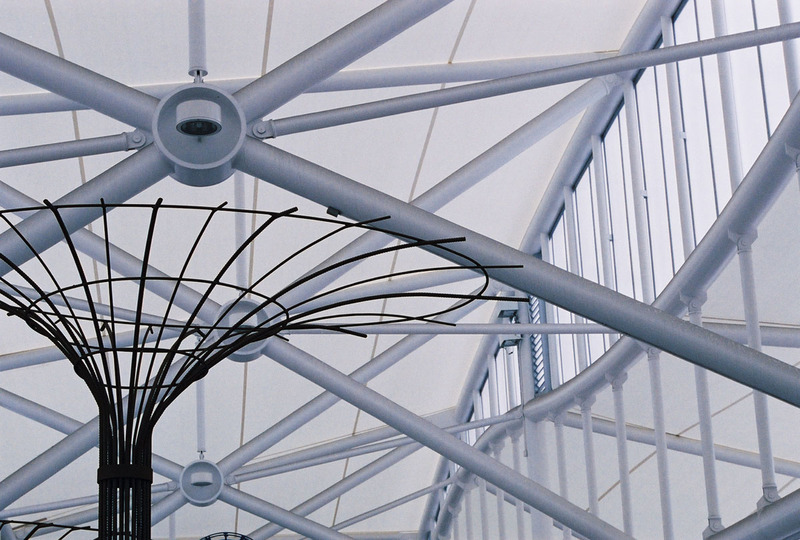 The new intermodal for down town Grand Rapids was envisioned to be a dynamic platform with a rolling tensile fabric canopy evocative of the adjacent Grand River’s glory. 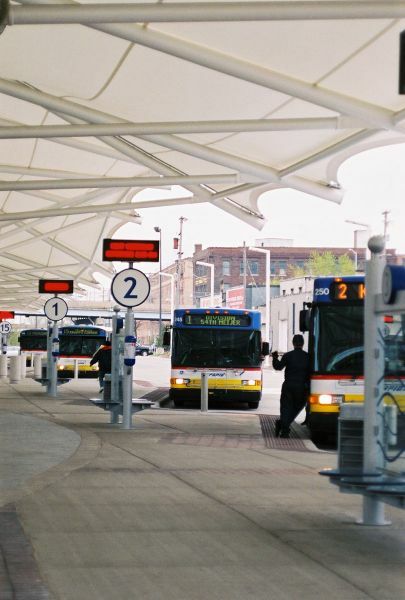 The very large space also needed to accommodate a significant amount of busses and act as the community’s central intermodal transfer facility. 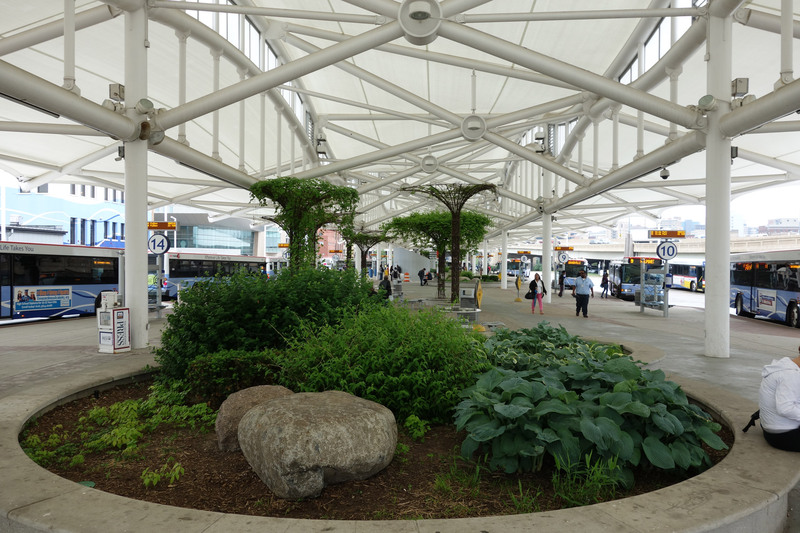 Creating a dynamic pedestrian space below the canopy was our challenge. 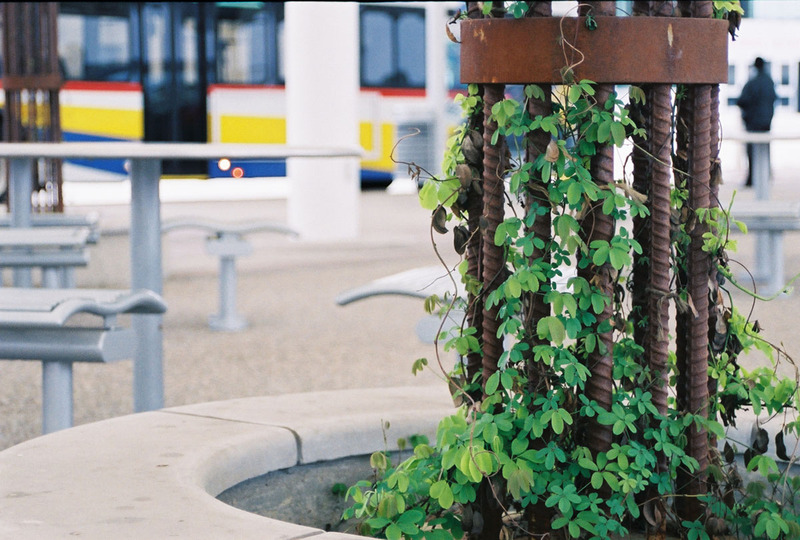 Capturing new riders and supporting existing riders is an ongoing challenge for transit facilities across the country, our goal was to create a unique and inviting space that would allow existing riders to feel safe and comfortable at such a large facility, and to also be attractive to new riders. Creating a “riverscape” of blue tile that meanders across the platform, with an overlay of brick to emulate the steel above allowed us to tell the story of Grand Rapids’ history and its future through materials. 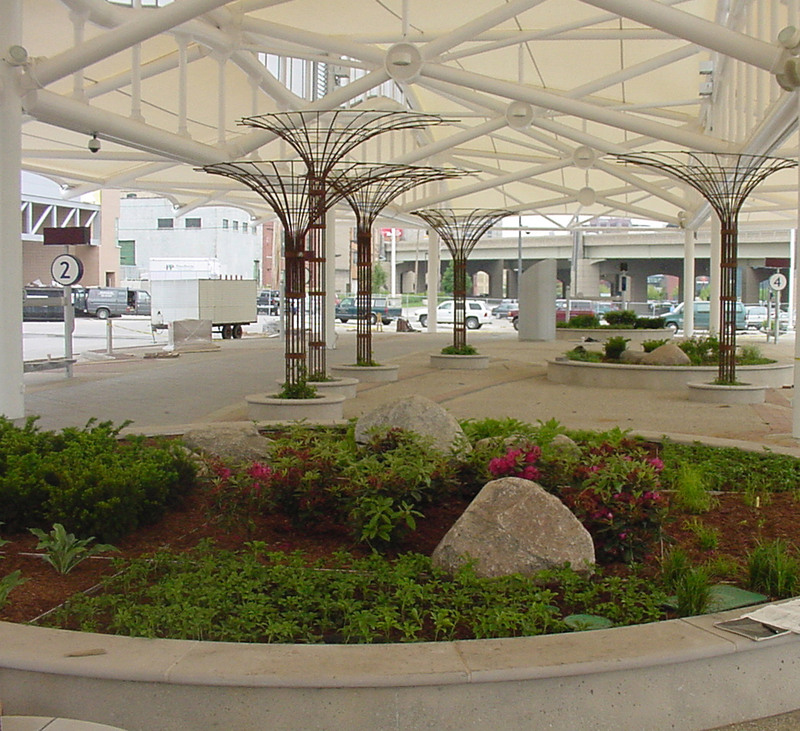 Two primary pedestrian areas anchor each end, with large planting islands and seating walls scattered along the river provide a respite for travelers as they wait for busses. The classic materials expressed in a contemporary manner allow the facility to connect with the existing neighborhood and the sweeping elevated highway adjacent to it. 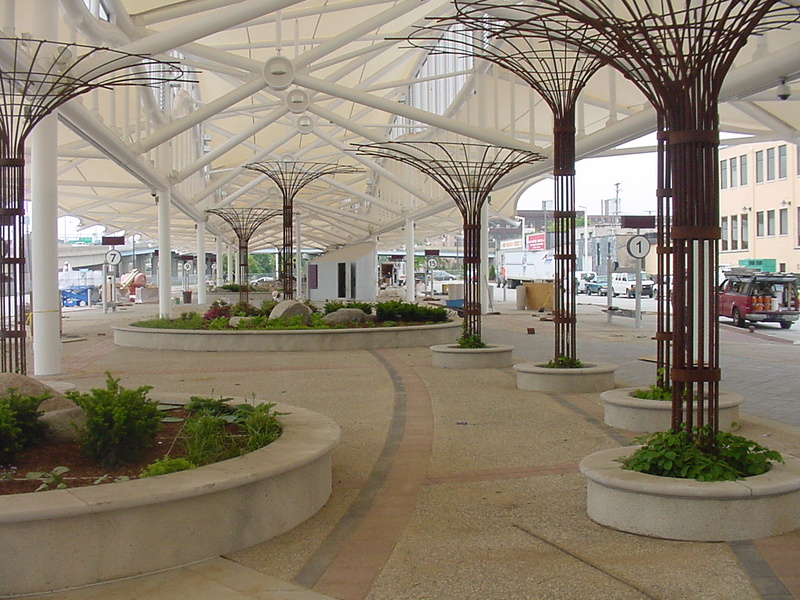 Steel trellis “trees” were designed to overcome the challenges of the fabric canopy, while providing scale. Seating planters with planting masses highlight the textural qualities of the small, shade tolerant plants used throughout the project. A decade later the facility has matured gracefully and riders can often be seen lingering for the later bus as they finish their coffee under the canopy of trees. Tensile fabrics, in order to remain strong and durable for many years are designed to reflect UVA and UVB light waves. This however, creates a unique challenge when trying to grow plants beneath it. The scale of the overhead structure and lack of usable light truly expanded the opportunities for an interesting and engaging design that would benefit the large number of people using the site each day. 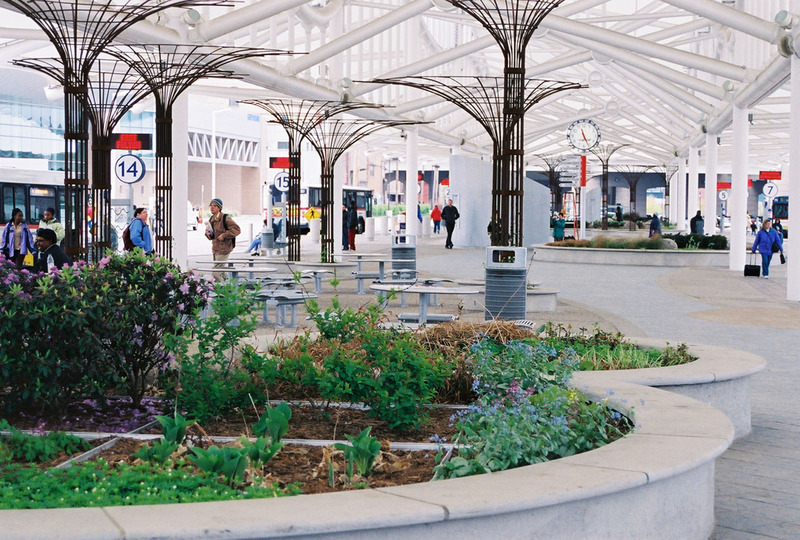 Amenity requirements of information kiosks, vending, ticketing and interactive routing boards provided the opportunity to scatter much needed vertical elements throughout the plaza. 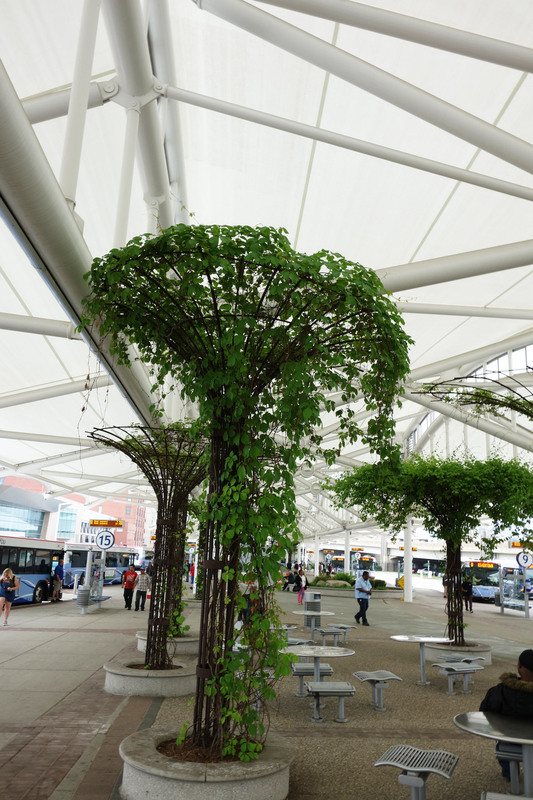 The constraint of the canopy limited the types of plant materials that could be introduced, and made it nearly impossible to sustain tree growth. 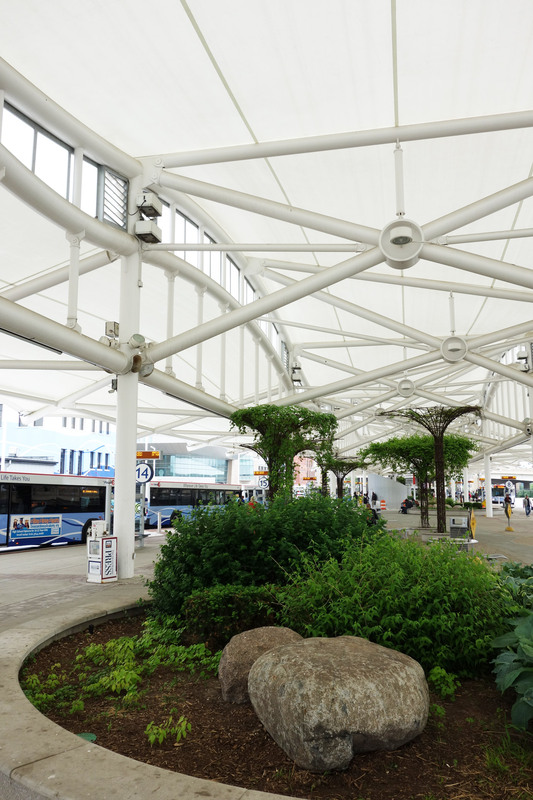 Yet we needed a strong vertical element that would provide a sense of human scale, and to provide a much needed sense of green amongst the sleek and contemporary overhead canopy. 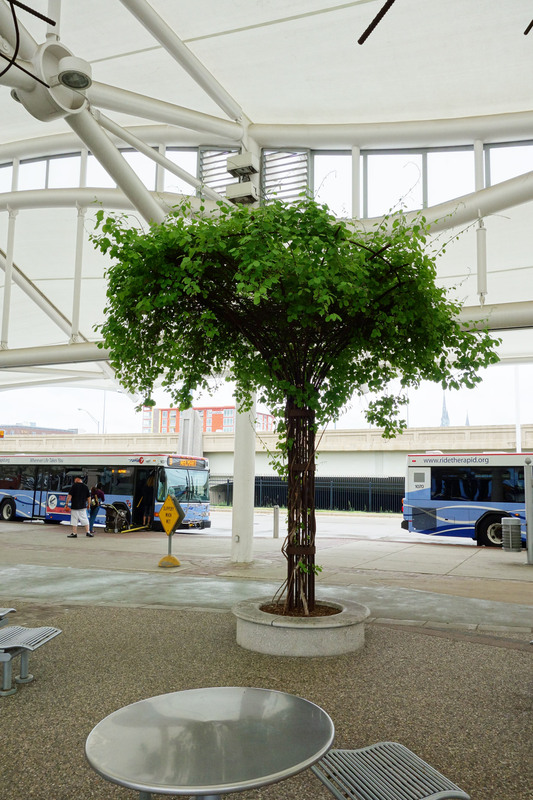 To achieve the scale of a tree without the infrastructure needed to support a living tree, we chose to create several steel “trees” that utilized a shade tolerant vine which scrambled up the trellis to create the height and scale of a tree. Tree trellises of varying heights surround the sandbars. As the vines climb to the top and drape over the ends of the trellis, one has the feeling of sitting along the forested edge of the river.